After Gurney took the opener, Cross silenced the home crowd with legs of 12 and 13 darts to lead and landed another 12-darter he moved 4-2 up. Gurney responded with a crowd-pleasing 112 combination, but Cross claimed three of the next four to seal a point before securing the win by finishing 124 on the bull. "I hit the big scores at the right times and I'm happy with the performance and the win," said Cross. "I've been scoring big and doing the right things at the right times, and darts is all about timing. If you can deliver the big shots at the right time, they hurt." Welshman Price was aiming to claim his first career win over the Dutchman, and came from a leg down to lead 5-1 with a superb run, which included a huge 128 bull finish. Van Gerwen pulled the deficit back to 5-4 and 6-5, but three missed doubles in leg 12 allowed Price to seal a minimum of a point at 7-5. 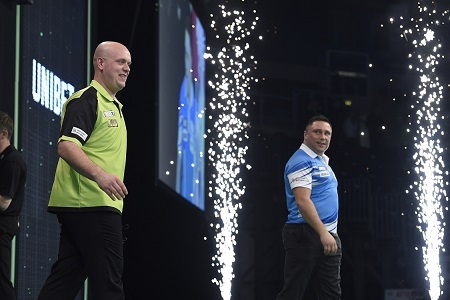 The world number one took out 90 with two double 18s to force a deciding leg, with Price then scoring 140, 135 and 180 only to miss two match darts at tops as Van Gerwen took out 82 to share the spoils. "Before the game I'd have taken a point but I'm still disappointed," admitted Price. "I should have beaten him. "At 4-1 or 5-1 you start to think you've got him right where you want him, but for three legs I went to sleep. "You always know he's going to come back with something big and he showed that in the last leg, but I bombed a lot of opportunities in that game. "I'm disappointed but I'm happy in another way - not many people will take points from Michael. It's so close that every point is vital." Van Gerwen conceded: ""I missed too many doubles and I shouldn't put myself in that position - at one point I was on 1/11 but I always believe in myself. "He played really good darts and this game had everything. I hoped I would get one chance and I'm glad he gave me it." Suljovic hit back from 2-0 down to lead 3-2, with Wade then taking out 96 to regain the lead before four successive legs - including a ten-dart finish - saw the Austrian move 7-4 up. 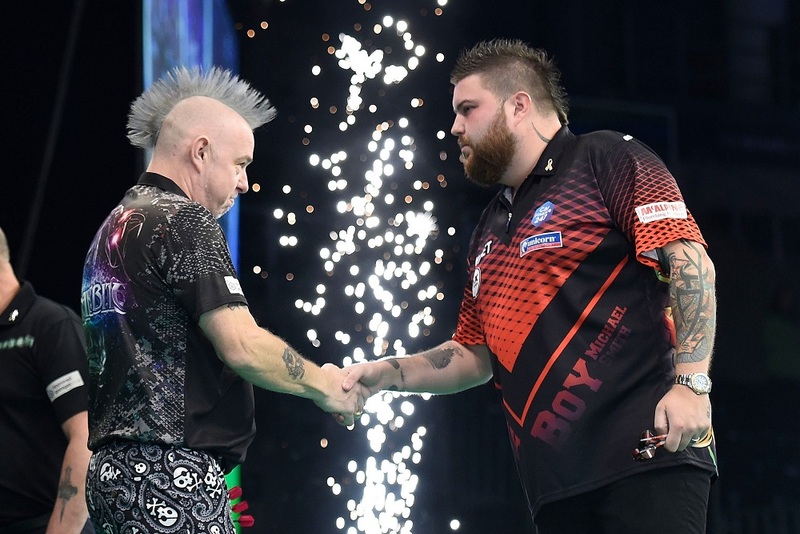 Wade finished double ten and a superb 137 checkout as he took the game all the way, but Suljovic opened the deciding leg with two 180s and bounced back from missing out on a nine-darter to nail double six for victory. 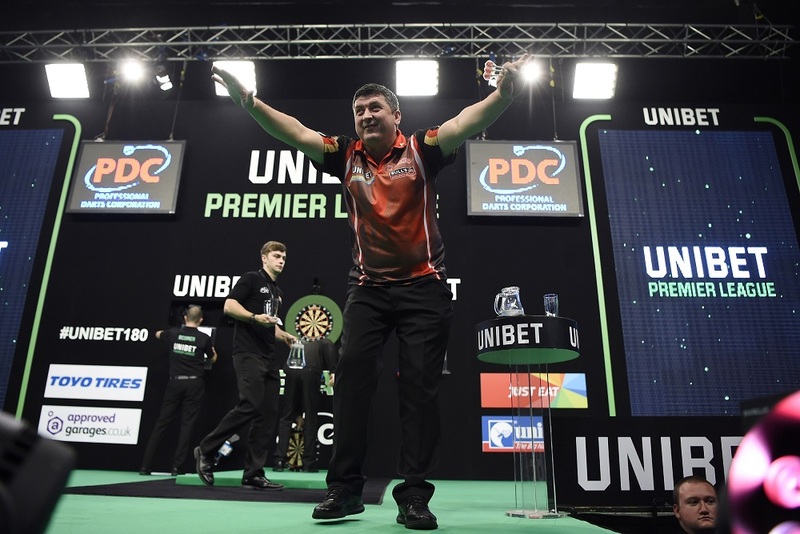 "It's a brilliant feeling," said Suljovic, who moves above Wade in the table. "James got 2-0 up but I had to focus on my game and I did that. "To draw seven-all would have been good but I'm so happy that I got the win because James is a brilliant player." 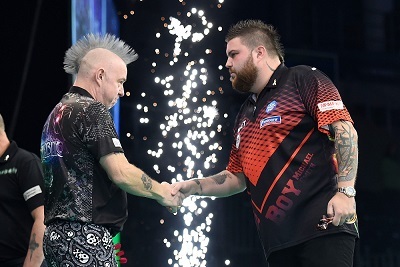 Smith finished 108, 130 and an 11-darter in the early stages, but Wright claimed the first break in leg 11 to move 6-5 up with a 14-darter. 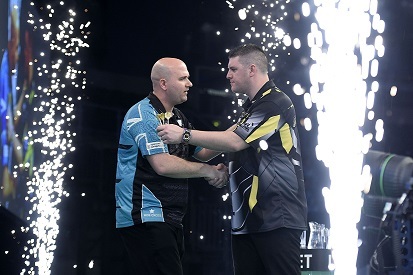 2018 Premier League finalist Smith responded in the same manner to break back and then finished 85 on the bull to secure a point at 7-6, but Wright landed a 180 in the deciding leg before double four secured a draw. "It's frustrating," admitted Smith. "I needed two points tonight to move me closer to the top four and I'm annoyed with myself, but I got a point and that's better than getting beaten. "The only leg I deserved to lose was the last one - I couldn't finish him off and my doubles were shocking." Wright said: "I was disappointed with my whole match. I didn't really start scoring until the last three or four legs and my finishing kept me in it. "Both of us could still make the Play-Offs but there's still a lot of games to go yet."